Elodea has only 3 leaves per whorl and no midrib teeth. 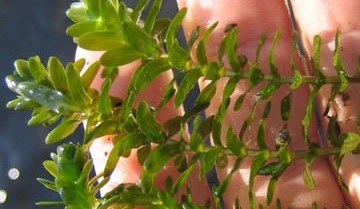 Elodea has dark green, blade-like leaves in whorls of 3 with finely toothed margins. The flowers of Elodea have 3 white petals with a waxy coating that makes them float. Elodea is often confused with Hydrilla and Egeria. Elodea has only 3 leaves in the whorl and no midrib teeth.The plant is rooted but can grow from small fragments. it is a good quarium plant and often goes by other names, such as Canadian Waterweed, Common Elodea, or Anarcharis. Dibrox® and Spritflo® herbicides are an effective treatment method for Elodea. You can order these products on this website.